Actually a cheap color display has lot of advantages over any other type displays. Monochrome graphic LCD display actually costs same. Other options of cheap display is Nokia 5110 Display (which is often reported by many users as buggy), standard 1602A LCD Display (which is an all purpose standard basic LCD display). Here is Getting Started Guide For Arduino TFT Touch Screen Shield Manufactured by MCUFRIEND. 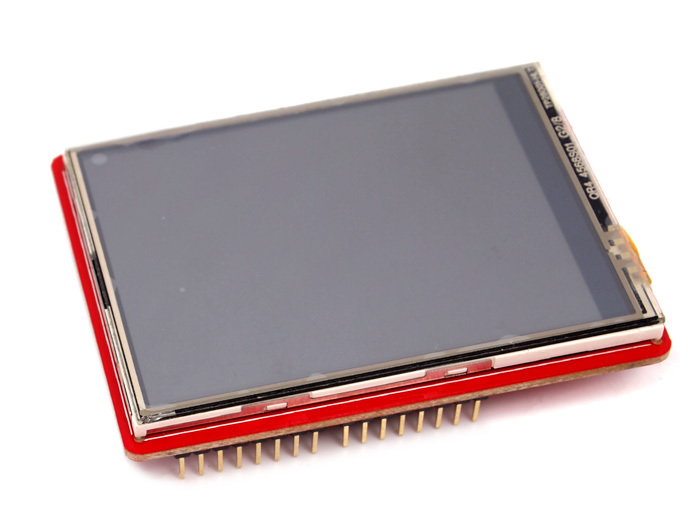 This is possibly the cheapest 2.4″ color display for Arduino. It costs around $8 to $10. MCUFriend is a China company and has an useless website. However, all over the web, there is huge support for this cheap display. The display works as intended. I purchased it from physical shop. It is a 2.4″ diagonal LCD TFT display, has white-LED backlight, resistive touchscreen, 240×320 resolution, has SPFD 5408 controller with built in video RAM buffer, has 8 bit digital interface and 4 control lines, it uses digital pins 5-13 and analog 0-3. there is a micro SD card reader. Made in China cheap stuffs usually means made from recycled electronics parts (in case you are not aware). The disgusting part of this screen is the odd red colored PCB delivering a cheap feel. I noticed that one corner slightly get warm after some time. However, peoples could use this display quite effectively. For Arduino UNO, you are actually having digital pins 2, 3, analog 4, analog 5 unoccupied by the shield. If you do not use the SD card slot then digital pin 12 is also available. 3 digital pins and 2 analog pins should be good for most of the basic projects but for multiple sensors, the actual need will be towards Arduino Mega instead of Arduino UNO. This shield does work with Arduino Mega but sometime oddly behave (may be there is some other problem with my piece). I lack idea whether the micro SD card slot actually works. Obviously as it is a shield, it is challenging to use the unoccupied pins. The easy trick is use to pass a single stranded wire. I read somewhere that it is possible to control the backlight by connecting a digital pin and transistor. Simply snap on the shield and use test code. If you use Arduino online IDE, for the GLUE_Demo_320x240.ino you need not to install any library. Does This TFT Touch Screen Shield From MCUFRIEND Worth Purchasing? Obviously! Except China none can give such thing at that price. Commonly with a microcontroller like Arduino, we are not going to do huge graphic intensive works unlike Raspberry Pi. You can save the money for Raspberry Pi’s good display. Our basic usage commonly will be making clock, calculator, showing some tracing from sensor, temperature humidity and so on. This quality of display usually enough. This Article Has Been Shared 9958 Times! Though This Article on Arduino to EV3 DIY Robot Guitar & Piano Player We Want to Deliver An Introductory Idea On What Peoples Are Developing. Here Is Best List of Budget Saving Cheap Arduino Modules And Components on Web With Which You Can Create Useful Projects And Will Not Repent. You Need Some LEDs, Couple of Resistors, Ceramic Capacitor To Build This Arduino Sound Meter With LED. Some Wrongly Refer These As VU Meters. Cite this article as: Abhishek Ghosh, "Arduino TFT Touch Screen Shield (MCUFRIEND) : Getting Started," in The Customize Windows, January 20, 2018, April 26, 2019, https://thecustomizewindows.com/2018/01/arduino-tft-touch-screen-shield-mcufriend-getting-started/.